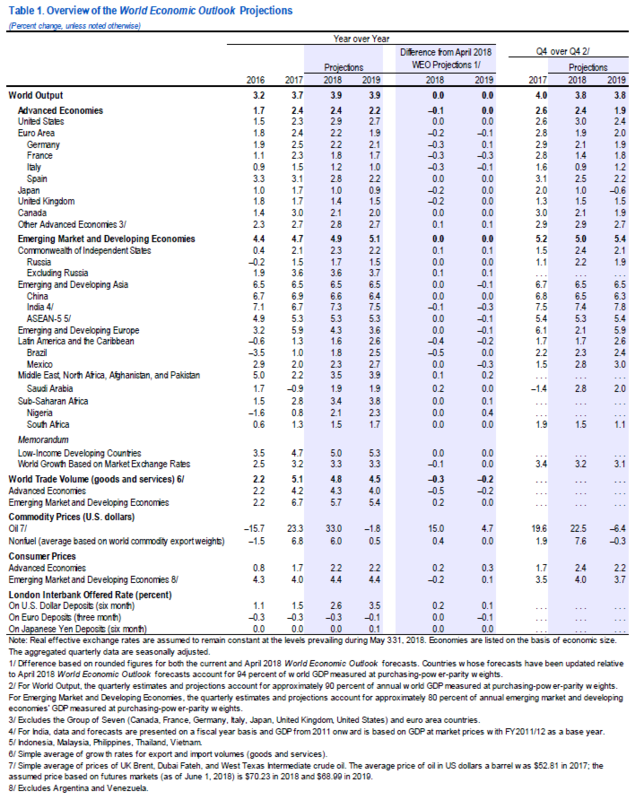 “Global growth is projected to reach 3.9 percent in 2018 and 2019, in line with the forecast of the April 2018 World Economic Outlook (WEO), but the expansion is becoming less even, and risks to the outlook are mounting. The rate of expansion appears to have peaked in some major economies and growth has become less synchronized. In the United States, near-term momentum is strengthening in line with the April WEO forecast, and the US dollar has appreciated by around 5 percent in recent weeks. Growth projections have been revised down for the euro area, Japan, and the United Kingdom, reflecting negative surprises to activity in early 2018. Among emerging market and developing economies, growth prospects are also becoming more uneven, amid rising oil prices, higher yields in the United States, escalating trade tensions, and market pressures on the currencies of some economies with weaker fundamentals. Growth projections have been revised down for Argentina, Brazil, and India, while the outlook for some oil exporters has strengthened. The balance of risks has shifted further to the downside, including in the short term. The recently announced and anticipated tariff increases by the United States and retaliatory measures by trading partners have increased the likelihood of escalating and sustained trade actions. These could derail the recovery and depress medium-term growth prospects, both through their direct impact on resource allocation and productivity and by raising uncertainty and taking a toll on investment. Financial market conditions remain accommodative for advanced economies—with compressed spreads, stretched valuations in some markets, and low volatility—but this could change rapidly. Possible triggers include rising trade tensions and conflicts, geopolitical concerns, and mounting political uncertainty. Higher inflation readings in the United States,where unemployment is below 4 percent but markets are pricing in a much shallower path of interest rate increases than the one in the projections of the Federal Open Market Committee,could also lead to a sudden reassessment of fundamentals and risks by investors. Tighter financial conditions could potentially cause disruptive portfolio adjustments, sharp exchange rate movements, and further reductions in capital inflows to emerging markets, particularly those with weaker fundamentals or higher political risks.